The zone is that state of mind where records are broken, goals are reached, and dreams are realized. Learn to enter it on command in the gym, on stage, or wherever else you need it! On any particular day, your friends on Facebook or BodySpace will write about how they crushed that day's workout, while others will write theirs off as lackluster. The next day, the posts might well be reversed. Your own performance might be equally hit or miss, making success feel like something that only happens randomly. Why can't you nail your workout every time? Why do you step up to some competitive challenges, and leave the stage dejected and defeated other times? What changes? Chances are that your best workouts transpired in what's called "the zone," a state of mind and body that enables peak performance. It is a place devoid of self-doubt, where it seems like nothing can go wrong. The zone correlates with the times in your life when you feel most alive. Your greatest triumphs occur when you're in the zone. After watching the great Michael Jordan drop 42 points on an opposing team during his heyday, I found myself in the Bulls locker room discussing his other passion—golf. I've worked with plenty of PGA pros to help them find the zone on the course, but Michael knew it was just as important on the court. "I know the zone," he told me. "I can put it on like an overcoat." If you want to perform at a high level in whatever it is you love, you need to get to know the zone. Master it, and there will be zero chance of you missing that last rep or failing to complete that interval. It's where inspiration translates to results. There are two major misconceptions about the zone. One is that it's 100 percent physical or genetic, like some sort of innate killer instinct. You might think, "Michael Jordan simply has 'it' and I simply don't." You're wrong. Your breathing slows and your skin sensitivity heightens. Your eyes create the illusion that everything happens in slow motion. In a crisis, that's so you can look for an avenue of escape, or fight off an adversary. Your jaw unclenches—which is why Michael's tongue would hang out at the end of close playoff games. Blood gets diverted to your brain and to the large muscles; this gives you mental clarity, as well as inordinate speed, strength, balance, and agility. Your conscious mind shuts down; your intuition takes over. Some people feel these physical cues and begin to panic, losing physical and mental control. In a sports context, this is when we say they "choke." They dribble the ball off their foot as time expires. They hook an easy field goal that costs their team the game. They drop a weight or stumble through a pose they've nailed hundreds of times, wasting months of preparation. On the other hand, other people experience those cues and immediately feel at home. They experience a euphoric rush as all the faculties of their body and mind immediately synchronize. All of a sudden, the baseball looks like a grapefruit, and the hole on a putting green looks like a waste can. I've made a career out of helping professional athletes find that space, be comfortable there, and use it for the incredible tool it is. When it comes to entering the zone, you can be like Mike, or Arnold, or anyone else who has risen to the occasion when it mattered the most. You can achieve the zone without negative stress, and get more enjoyment out of your training and competition as a result. Along the way, you'll develop more self-discipline, concentration, optimism, and feel more relaxed when it matters most. The zone doesn't have to be momentary or fleeting. There are ways to train, compete, and reside in the zone so it becomes an integral part of your lifestyle. 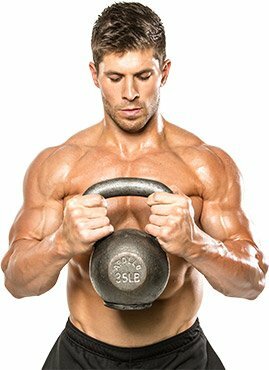 I'll be writing about the zone for Bodybuilding.com in the coming months, but I want to begin by offering you a few simple tricks for entering the zone anytime you want to. They take time to practice and master—like anything else you do in the gym. But they also take just a minute or so to deploy; you can access them any time you feel your goals slipping out of your grasp. "If you start thinking negatively, just reboot." Your brain is more or less a computer. And like any computer, it doesn't like it when you leave programs open while zipping between tasks chaotically. The processor can only handle so much at any given time before it slows down or freezes. So what do you do when you receive the mental "program not responding" message? You hit control-alt-delete. Do this: If you have a lousy set or two, reboot. Shut your eyes. Unclench your jaw. Slow down your breathing. Shut off the dialog of panic in your brain, and visualize a dark screen. Now hold that image for as many seconds as it takes for the dark screen to become vivid, and for calm to take over. Open your eyes, raise your chin above parallel, and direct your energy away from you, and back into your next set or your next objective. Benefit: Each time you do this, you receive a little shot of serotonin, which is the one brain chemical you need to secrete in order to attract the zone. Keep practicing it, and you'll find you can leave the past behind and relax in any stressful setting. Use this in your training, but in your everyday life, too. If you start thinking negatively, just reboot. Look at the nearest light switch on the wall. You flick it and the light comes on. Flick it again and the room goes dark—it never fails. Great metaphor, right? Actually, it's more than that; it's a physical technique that has been shown again and again to help people find the zone and stay there. One of my former clients, Chicago White Sox slugger Frank Thomas, would raise his head after a strikeout on the way back to the dugout. People thought "The Big Hurt" was being cocky, but he did this to avoid replaying the strikeout in his mind. He wanted to stay in the zone at the moment when his opposition was trying to push him out of it. "You'll find you're more capable of finding solutions and taking control when circumstances seem to conspire against you." Do this: Imagine your head is a light switch. Shut your eyes, lower your chin to your chest, and hold whatever negative thought is consuming you. Now, with your eyes still shut, raise your eyes to the ceiling. Drop your chin back down to your chest, raise your head again, and drop your head back down to your chest. One more time, raise your head up, and then open your eyes. That's three toggles of the light switch in all. When most people raise their head, the negative thought goes away. When they drop their head, it comes back robust, concise, and crystal clear. By the third repetition, the thought has almost always drifted away. They have to work to reconstruct it, if they can even remember it at all. So mom was right: Keep your chin up. Benefit: You only need a couple of seconds to make it work. You'll find you're more capable of finding solutions and taking control when circumstances seem to conspire against you. Your subconscious doesn't know the difference between fantasy and reality. That's why when you have a nightmare you wake up sweating with your heart racing. What you feel seems so real that it can sometimes take you a few minutes to realize you're not "there" anymore. Plenty of high-level performers have found they can use this immense mental power to their advantage by simply memorizing a personalized positive "I" statement. For instance, during his Hall of Fame career, Frank Thomas repeated the phrase "I hit solid with an accelerated bat" more than 10,000 times. For him, that sentence conjured an image of him hitting solid with the form he knew worked best. After some time, his subconscious mind relented and said, "I can make that happen for you." The results spoke for themselves. "If you're having trouble sticking with your healthy eating plan, make your affirmation 'I eat healthy.'" Do this: If you're having trouble sticking with your healthy eating plan, make your affirmation "I eat healthy." Say it as often as you need to, whether tempted when passing a drive-thru lane, ordering from a menu—whatever the situation. It doesn't need to be audible to anyone else; you say it to yourself. The same technique can be tailored to training, athletic performance, or any situation in your personal or professional life. See it, say it, be it! Benefit: Like anything in life, you need to put in plenty of reps for this to do its work. But once you take it seriously, you'll find that the temptations and distractions that once ruined your best-laid plans get reduced to nothing. They're still there, but they're no longer your concern. You'll become more secure in your choices and your ultimate destination will come into clear focus. This is when great things start to happen. 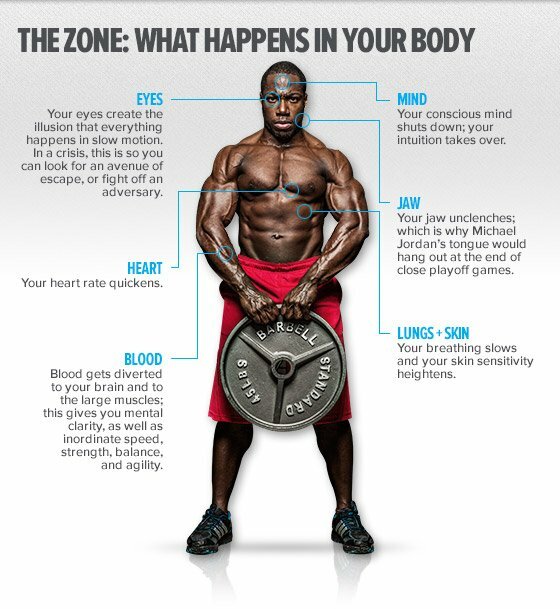 Have you experienced moments in the gym or on stage where you felt like you were in the zone? Let us know in the comments what made the difference for you! Jim Fannin is a motivational speaker, author, and life coach with more than 40 years of experience inspiring athletes, corporations, and individuals.